TP115-110, Video Card from Altinex. Altinex announced the availability of the TP115-110 / TP115-111 Computer/Component Video + Audio UTP Transmitter / Receiver. The TP115-110 / TP115-111 are suited for integrators and AV technology managers looking for a means of distributing computer video and audio signals long distances to reach the presentation display or projector. 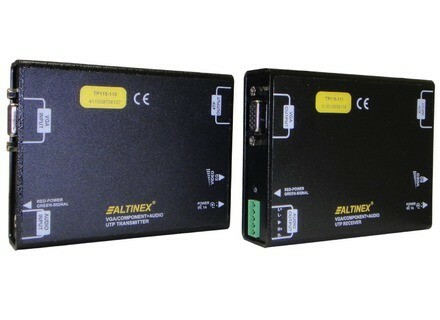 The Altinex TP115-110 provides transmission of computer video and audio signals over Twisted Pair-type (CAT-5) cable while the TP115-111 receives computer video and audio signals over twisted pair-type (CAT-5) cable. The units offers video equalization (developed and patented by Altinex) designed to facilitate long cable runs, and a signal detect feature shows when a signal is present. With the TP115-110 UTP transmitter adjacent to the source PC and the TP115-111 UTP receiver adjacent to the destination display/projector—and the CAT-5 cable spanning the distance between these two units—the computer video and audio signals are designed to be able to travel long distances. The TP115-110 transmitter receives the computer’s video output via a 15-pin HD female connector. Stereo audio input is received via a 3.5 mm jack and is converted to mono prior to transmission. The transmitter outputs these signals over the CAT-5 cable utilizing an RJ-45 network connector. At the other end of the CAT-5 line, the TP115-111 receiver receives these signals via its RJ-45 network connector and then outputs video via its 15-pin HD female connector while audio is output via a 5-pin terminal block. Both the TP115-110 transmitter and the TP115-111 receiver have an audio bandwidth of 20 Hz – 20 kHz. Both the transmitter and receiver have a horizontal frequency range of 15 kHz – 95 kHz and a vertical frequency range of 50 Hz – 180 Hz. The Altinex TP115-110 / TP115-111 Computer/Component Video + Audio UTP Transmitter and Receiver are available now with MSRP pricing of $340 and $351 respectively. Visit the company online at www.altinex.com. Cubase 6.5.1 Prerelease, 6.06 Update Steinberg has released two new updates for the Cubase 6 series. Swar Studio Updated to v1.1 Swar Systems has updated Swar Studio to version 1.1, which now lets you add your own custom virtual instruments to the mix. Audio Evolution Mobile for Android eXtream Software Development has released its multi-track audio app Audio Evolution Mobile for Android.